Are you getting ready to go Cruising? There are a few things you might want to know that will help you when you get those bags packed. I am always a very organized packer from zipped bags to items we ‘might’ need to things we ‘have to have.’ While you can buy most anything you forget, I am personally more relaxed if I make sure we are have what we need without over packing. Here’s a few tips on what to pack on your carry-on bag for those first few hours on the ship, this will help you maximize your fun and let you start partying right away! Are you ready to go Cruising Carnival? We sure were! Once you board the fun begins, so get ready lavishly live cruising out loud and to sail away to a land of fun. Since your luggage will be delivered to your room(the larger pieces) make sure to pack a carry-on bag that will let you join in on the fun right away. We packed a few things that let our kids start swimming and us start relaxing and as soon as our room opened, we just dove into our carry-ons, grabbed what we needed and began our vacation. Are you ready to begin Cruising Carnival? Use these Packing Tips for Day One! A big smile because your cruise has begun! When you initially get to the ship, you can’t get into your room, generally until about 1:30p sometimes a bit later. You head in and go to the LIDO Deck where you eat and drink the buffet is waiting for you so don’t be shy, dig in! Your luggage may arrive a while after you are able to actually get into the room, this does not matter, you don’t need to do anything until dinner time anyway and by then, your luggage arrives. Remember, the luggage that is being boarded is for 3000 other guests as well on this trip. Be patient, it does get there, but you should have a small bag already packed so you can just go have fun! Pack a bag as I suggest above and if you are a pool person you will be set to go and if not, pack a set of fresh clothes and get ready for your first meal in the dining room, depending on the dining time you chose. Shower up to feel refreshed from your trip to the ship, settle in, turn on your cabin television and relax and wait for the muster drill either in your room or somewhere else in the ship. Headed To The Pool Cruising Carnival? Do I Need To Bring Beach Towels? Don’t take up valuable space in your luggage, USE the TOWELS that are provided to you in your stateroom! The towels in the Stateroom are there for you to use and bring back. 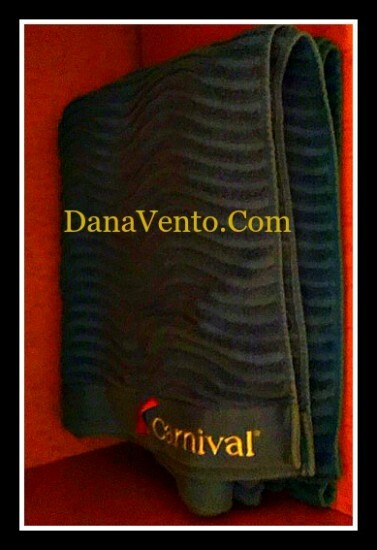 We took these towels to each port of call, and when we returned our cabin steward replaced them with new ones. When you head to the pool, there is a Towel Cabana for you to check out towels from. You present your ID(that you are carrying on your lanyard) and you get a new towel. During the day, if your towel is wet and you want a dry one, you simply exchange a towel. At the end of your pool time, or lounging time, check your towel back in, they cross your name off the list and you are free of the towel, it is that simple. Don’t feel the need to pack a towel they are there and waiting for you. Make certain you return your towel and get it checked off the list or you will pay $22 per towel! Packing a carry-on allows you to have the ability to jump into the fun quicker if you so choose to swim and did not wear your suit. You can place you bag on a seat on the Lido Deck and then grab a plate of food. You will find you are in good company as most other in-coming guests will do the same. Here’s to lavishly living cruising out loud on the High Seas with Carnival Cruise Lines! We were provided a room on the Carnival Sunshine, all opinions expressed were my own. Excursions, drinks(alcoholic, etc) were provided by me! These are awesome tips. I actually have a friend leaving for a cruise soon so I will pass this along to her. I so badly want to go on a cruise! This sounds like such great information. So happy to read the tips. We’ve been discussing a cruise for a while now. They sound so wonderful. This is definitely a wonderful list of helpful hints for cruise packing. I would like to take a cruise next year (it’s been so long!) and the list will make it easier for my oldest daughter to only take what she needs or feels she must have. So many people don’t realize that there are some small items that you take for granted at home that you will miss when you go on a cruise. These are some good tips to help make it a little easier for them. I always pack to much stuff. I am hoping to go on a cruise in the next year. Thanks for the great packing tips. A lanyard.. that is one item I wish I would have brought along during our cruise. This is a great list!! For anyone who is even thinking about taking a cruise this post is a must read! These packing tips are GENIUS AND WILL SAVE YOU having to scramble to get stuff on the ship or when you dock at ports! Great to know! I have never been on a cruise but hope to go on one someday, so this helpful. I am awful at packing for anything so I’m sure I’d be scrambled for a cruise. Some great info. Never been on a cruise but we are researching them for our next vacation. Thanks for the tips! It’s been a while since I last went on a cruise and it would be nice to take the kids next time. It’s important to have a small bag that have your essentials so that you don’t have to wait around for your luggage to arrive. Thanks for the tips. We have taken cruises before and you have given us more information on how to make the most of our trip. That lanyard idea is great. We will remember to do that next time. A cruise sounds like so much fun! I would love to go on a cruise with the family soon! These are fantastic packing tips. We really need to set out on another cruise one day soon. felicia recently posted..Surviving the First Week of School! I have never been on a cruise, but now I feel like I’d be a little more prepared after reading this. I bet you had a fabulous time on your cruise! Theresa recently posted..AutoRight SteamMachine Gets the Car Clean without Chemicals! I’m totally new to cruises so this helps a lot. Thanks for the heads-up on the room and the luggage situation! Lisa Joy Thompson recently posted..LuLaRoe: Reviews of LuLaRoe Clothes Plus Enter to Win LuLaRoe Leggings for You and a Friend! that’s just it, the sun is shining, the drinks are moving all around and you and your family or travel partner are in one spot. It’s time to sun and enjoy.. Best part of the cruise, the first few hours on the ship.. Most sad.. last day… It’s all done! With the amount of traveling we do, packing is my least favorite. These are great tips, especially for cruising! I have never been on a cruise but once I go I will definately be using these tips! This is a good list to keep handy. I always forget something in my luggage (whether it’s a cruise or not). I appreciate the tips for packing for a carnival cruise because I wouldn’t even know where to begin because I’ve never had the awesome experience of traveling on a cruise but hopefully someday soon. This is a great packing list for carrying onto your cruise. I have been thinking about going on a cruise some day. These are all excellent tips. 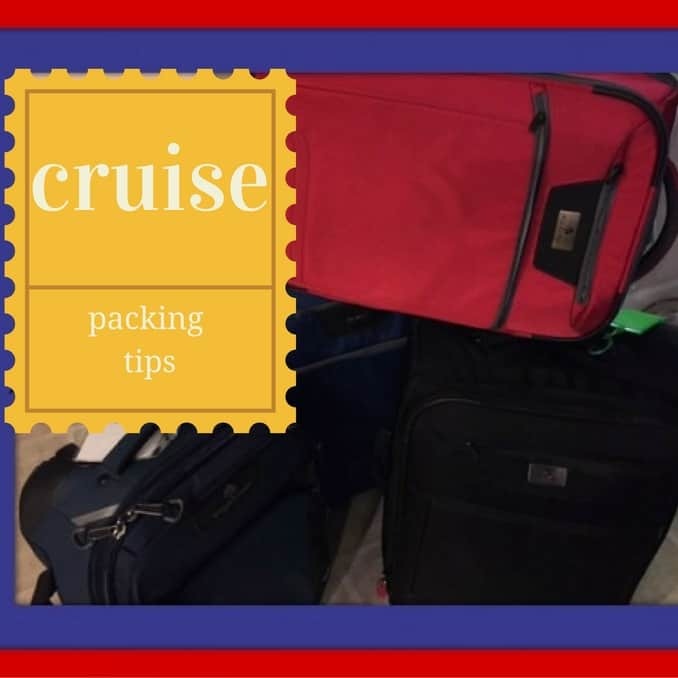 As a veteran cruiser, I know that packing for a cruise is completely different from packing for any other trip. Your cruise sounded amazing! I love the tips for packing. I’ve never been on a cruise and would have over packed if I didn’t know better.